Considered to be leading the mobile sensing revolution, Sleep by MotionX is the leader for Health with continual innovation. Developed By MotionX™, this app certainly is the best professional medical-class tool for iDevices, with seven years of research and development in the biomechanics of natural human motion and sleep optimization. Being the first app to measure and correlate resting heart rate, Sleep by MotionX includes advanced sleep cycle monitoring with smart alarms and power naps, and incorporates "Get Active" alerts. • Advanced automatic Get Active alerts. With Sleep by MotionX on your iDevice, you sleep better by analyzing your sleep cycles and wake up at the optimal time in your sleep cycle, guaranteeing the feeling of being refreshed. You’re even able to see your light sleep, deep sleep, and total sleep times and fall asleep to white noise or music, which auto-fades out after you fall asleep. Choosing the right time to wake you up via the intelligent alarm clock, which rings your favorite iPod song, snoozes and vibrates at the optimal time in your sleep cycle makes your mood guarantees that you wake up relaxed and are more active throughout the day. Sleep by MotionX enables users to accurately track their daily steps and calories burned, as well as set up "Get Active" alerts to learn when they've been idle for too long. A voice coach is also available, tracking progress and motivating users to keep moving. Moreover, Sleep By MotionX user the iPhone camera for detecting the pulse from user’s fingertip, similarly to the technique used by pulse oximeters, records resting heart rate and correlates it with sleep quality, as well as monitors user’s real-time pulse waveform. 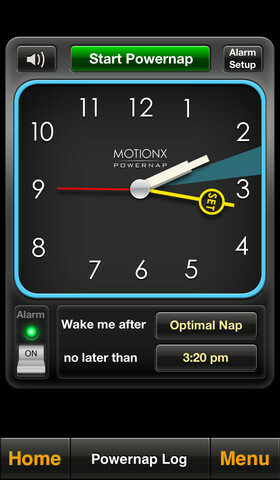 As you see, Sleep by MotionX certainly is the truly refreshing app that works wonderfully! The good news is that Sleep by MotionX is now available for 70% off, down to $2.99 from the original $ $9.99 for a limited time! So go and grab Sleep by MotionX for a holiday promotion price from Apple App Store and sleep better, wake up refreshed and be more active every day!